Today's card is for the ric#4 - Christopher Kane Resort 2012 challenge posted on the Runway Inspired Challenge blog. 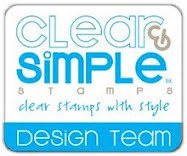 Since Clear and Simple Stamps is the sponsor of the challenge I used their stamps for my card. For the images I used the Across the Miles set from Clear and Simple Stamps and in keeping with the rainbow image from the challenge I colored the hot air balloon in a rainbow pattern with Copics. I added a green mat to my card in honor of the green shoes the model is wearing in the inspiration photo. Holly Wow Batman this is aweasome. I love simple cards and this one is perfect. I LOVE the bright colors you added. Great Job! Oooh...the super saturated colors in the hot air balloon look great against the pure white. Thanks for playing along with the Runway Inspired Challenge! This could not be sweeter. The positioning of the clouds and the balloon is spot-on, too. Thanks for playing with us at Runway! Love it!! This gives a feeling of freedom! I always love white on white, but with this pop of colour--it's simply fab!! your rainbow balloon looks awesome! Congrats... such a sweet card. Love all the white.